This Peppermint Mocha Mudslide is perfect to warm up on a cold winter day or be the hit at your next holiday party! Crush up a candy cane or peppermint candies into small pieces and spread on a small plate. Pour simple syrup on another small plate so that it is about 1/4" deep. 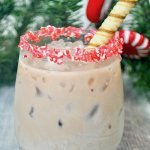 Dip each cocktail glass into the simple syrup so that the rim is fully coated, then dip the rim into the crushed candy cane until it sticks to the glass. Allow to set. Fill each prepared cocktail glass with ice. Add all liquid ingredients to a cocktail shaker with ice. Shake vigorously for about 5-10 seconds. Strain and pour into your cocktail glasses. Enjoy immediately.